This is a freestanding wall fountain with pool, priced at $1300 to $1500 depending on the size. 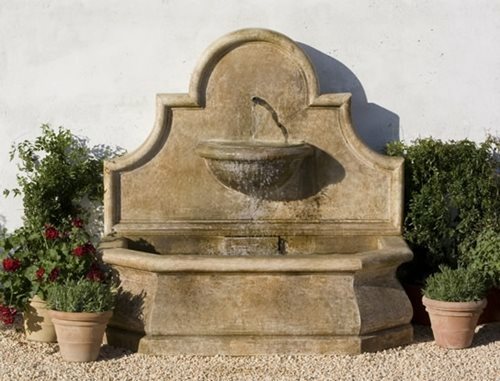 A large traditional Spanish tier fountain with a large basin ranges from $3000 to $5000. 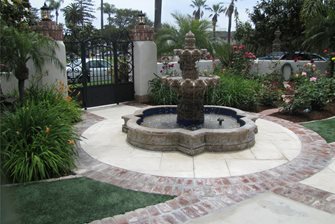 This smaller sized pedestal tier fountain lacks a pool, freeing up floor space underneath at costs from $500 to $900. Average Fountain Cost These prices are based off basin diameters for fountains made of concrete or cast stone. 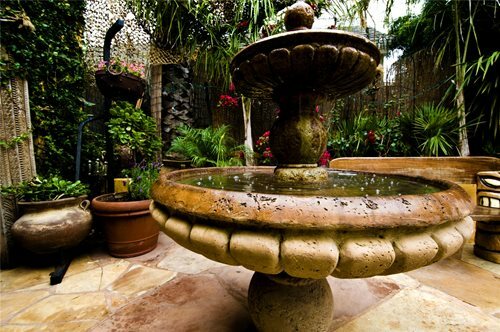 Installing a fountain as part of an overall landscape design always delivers a fresh feel to the surrounding spaces. 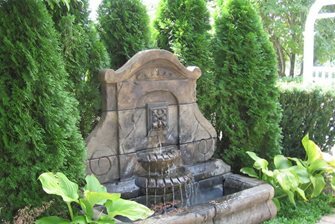 The availability of prefabricated fountains is mind boggling in the sheer range of sizes, styles and finishes available. 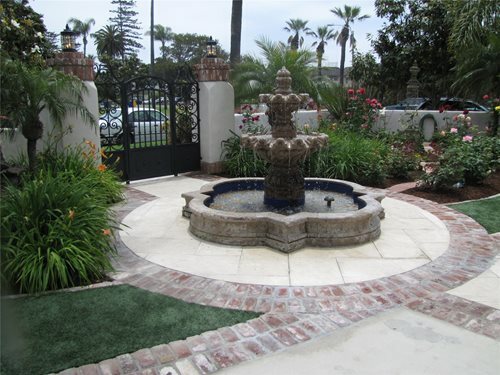 Your landscape designer will have a particular fountain in mind when visualizing your project, or they may have simply designated a footprint on the plan that shows the size and location of the fountain of your choice. There are so many options today that cost ultimately becomes the deciding factor. Cost of the fountain unit is based on the size of the fountain and the material it’s made of, which is typically cast concrete. The most innovative are fountains cast from fiberglass and resin composite materials, which are far lighter in weight for wall mounts and roof gardens. 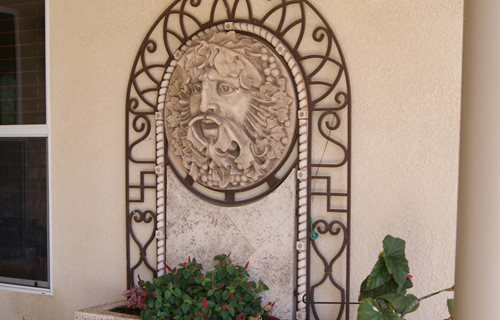 High end fountains made of carved granite may prove heavier than concrete. 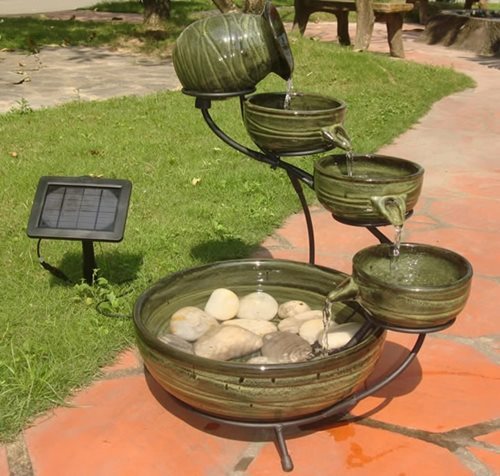 Fountain costs are for the unit itself, but there will be additional installation and set up charges. Fountain Size/Type Cost RangeEach type of fountain has its own application, so these costs relate to the purchase of a residential sized fountain. Power: A 110V outlet is necessary to run a fountain. If there is not a safe GFI outlet nearby you may have to run a new line. This requires an electrician and providing the conduit etc can cost as much as the fountain itself. Water: If you don't want to hand fill your fountain with a garden hose, you may opt for an auto-fill device. To install one you must have a pressure line close to the fountain to supply the unit. A landscape contractor can install one for you. Autofill: Where there is access to water lines, installing a simple autofill system can keep your fountain full and flowing without lifting a finger. Transport: There may be additional costs for delivery of very large/heavy concrete or stone fountains. Installation: Your landscape contractor may charge additional labor to set and level your fountain as well as hook up of water supply lines.